"Thou shalt never listen to the rogue again!" "Silence, girl! Have I not said it? Thou shalt never go to hear him preach again! He is a pestilent knave. He will bring all who hear him to trouble. Dost hear me, girl? Thou shalt not go!" "Silence!" thundered the angry man. "I have spoken; let that be enough. Thou shalt have no more of this preaching dinned into thine ears, and neither will I. Thou shalt never hear Mr. Bunyan again. He has done harm enough already." Agnes was absolutely aghast at this sudden outbreak, for which she was totally unprepared. She and her father had for some while been attending with great interest and profit the teachings and preachings of the notable Puritan, John Bunyan, whose wonderful personal experiences brought home to his hearers a sense of reality which was often lacking in other teachers. Farmer Beaumont had, however, of late been strangely silent and morose, so that his daughter had been rather afraid to speak to him. She had noted that he had not mentioned the approaching preaching, which she was most anxious to attend; but she had no idea that any great change had come over him till he suddenly burst forth in this manner, as they were sitting together at supper, after his return from the neighbouring town, where he had spent the previous night. Of course, Agnes was well aware that by many people this John Bunyan was regarded as a dangerous man, and that these inveighed against him as a preacher and teacher of strange new doctrines. Sometimes, she knew, it was dangerous to attend these meetings. She had heard it whispered before now that persons were often brought up before the authorities and fined or otherwise punished for offences of this sort, but it never occurred to her that her sturdy father would be frightened. She had no fear for herself. She believed she heard Heaven-sent gospel from this preacher, and she longed to hear him again. It was plain to her that somebody had got hold of her father during his absence from home, and had worked upon the fears that were beginning to agitate him before. She knew that there was a lawyer there—a man she especially disliked and distrusted. Once he had been suitor for her hand; for Farmer Beaumont was reputed to be a warm man, and Agnes was likely to come into the bulk of his property and savings at his death. But the girl had repelled his advances with energy; having an intense dislike to the sly, fox-faced man of the quill, and he now repaid her dislike in kind, and she believed that on more than one occasion he had sought to poison her father's mind against her. She suspected that this was the case now. It was plain that the old man was in a very angry mood. After sitting awhile in glowering silence, he broke out again even more fiercely than before. "I'll have a promise from thee, girl; thou shalt promise me here and now that thou wilt never go and hear one of his preachings more. Say the words and have done with it." "Oh, father, do not ask me to make such a promise as that!" "Ay, but I will. I'll have no disobedient daughter in my house. I've had a talk to Farry about it. Thou first will not have him for a husband at my bidding; now thou art taking up with this pestilent preacher Bunyan——"
"But, father, thou didst take me thyself to hear him, and said he was a godly man. It is Farry's evil tongue that hath wrought this change in thee. Prithee, pardon my boldness, but I dare not promise what is against my conscience!" "It is against thy conscience to obey thy father, girl?" raved the angry farmer. "A pretty conscience in all sooth. I'll have that promise from thee to-night, or else I'll drive thee from my doors, and disown thee for my daughter!" Agnes was in great distress, for she loved her father, and had always been an obedient daughter; but the stern tenets of the Puritan divines had penetrated deeply into her soul; and she was sorely afraid that by obeying her father she would be trifling with her soul's salvation. Most sincerely did she desire to do right; but it was so hard for her to know what was most right. "Dear father, I will promise you this, that so long as you live I will not go to one of these preachings without your consent; and I beg of you not to ask me more than that." On hearing these words spoken whilst the tears ran down her cheeks, the father's rage suddenly abated. He kissed Agnes and told her that she was a good girl after all; and the storm in the house died down to a calm. But poor Agnes was very unhappy. It seemed to her as though in obeying her father she had in some sort violated her conscience and betrayed her Lord. When she consulted her married sister and brother-in-law on the subject (all ardent admirers of Mr. Bunyan), she found that they also took this view of the matter, and her trouble became very great. It was now her chief aim and object to gain her father's consent to her attending the approaching meeting, where John Bunyan was to preach and afterwards to administer the Sacrament. It seemed to her equally impossible to remain away or to break her word to her father; and her only hope of real peace of mind lay in winning his consent to her going there. During the last two days he had been much kinder to her; but still she was in great fear lest he was in the same mind with regard to Bunyan and the preaching. She got her sister to come over to the farm the evening before, and by talking and a certain amount of coaxing and argument, they at last won the old man's permission that Agnes should accompany her relatives to the meeting at Gamlinhay, they promising to get her taken and returned, as the farmer had no mind to assist her by sparing one of his own horses to carry her, and the distance was too far for her to walk. It was a great joy to Agnes to win this permission; and she was more sure than ever that it was Lawyer Farry's jeering words and overbearing arguments that had caused her father so to turn against her and the preacher; for since he had been at home with her again, he had become quiet and reasonable. But she thought it would be wise to be off and away early upon the morrow, lest he should in any wise change his mind; and so she rose with the sun, set about her morning tasks with great energy, and had taken her own breakfast and left everything in readiness for her father before she slipped into her riding dress, and made her way across the fields to her brother-in-law's house, without having caught a glimpse of the farmer. Indeed, she had left the house before he was astir. "He is coming!—He is coming!—Surely, husband, that is Mr. Wilson on his nag?" Bunyan looked down at her with rather a grim smile upon his face. "It is not Mr. Wilson—it is Mr. John Bunyan himself!" "Then he shall carry you, Agnes!" cried her sister, "and you will have the pleasure of his godly conversation on the road." "No; I will not take her." Sudden tears rushed to the eyes of Agnes; she hid behind her sister that he might not see her weep, and again she heard the tones of his voice—the voice she had come to love so well. "If I do, her father will be grievously angry. I have heard how he has changed towards me. I will not set a man at variance with his children. Children are an heritage from the Lord." At that Agnes ran forward, and told him what had happened, and how her father had consented that she should go to the preaching. Bunyan looked down at her with rather a grim smile upon his face. "Ay, child; but did he say you might ride pillion behind the preacher?" "If I were you, maiden, I would go home to my old father, and seek to soften his heart by childlike obedience and submission, rather than urge him vehemently to gain mine own way." They had not proceeded far on the road before they met a man on horseback riding in an opposite direction. To her dismay and annoyance Agnes saw that it was Lawyer Farry, and she felt certain he was on his way to her father's house. She knew well how he would stir up the old man against the preacher, and it could not be but that her father would be very angry to hear that she had been seen riding behind Mr. Bunyan to the preaching. Probably he would think this thing had been arranged beforehand, and no doubt Farry would do his best to encourage that idea. Bunyan, however, not knowing the lawyer, paid no heed to the stranger, though he continued to give Agnes much good advice as to her relations with her father, advice that the girl promised faithfully to follow. "For, indeed, I have always loved him dutifully; and till lately he has been a tender father to me. But he has been embittered against those things which I hold so needful for my soul's salvation, and I am torn in twain betwixt my duty to him and to God." "Ay, ay, my child, thy path may be sometimes a difficult one; but remember that faith in Christ is enough for salvation, and thou wilt never imperil thy soul by abstaining from hearing some godly preaching, albeit such preaching may strengthen and sustain thee. God gave thee thy father and bade thee reverence and obey him. There is no doubt about that duty, so look to it in the future." This gentle counsel set Agnes thinking deeply; and since it came from Mr. Bunyan himself, she could not but believe it good. Greatly as she delighted in the preaching and meeting which she had made so great a point of attending, she was possessed by a longing to be at home again, to ask her father's pardon if she had thought too little of his wishes, and to show him in the future a greater patience and affection than had been possible of late. At the close of the meeting she was in some perplexity how to get home, since Mr. Bunyan was not going back that way; but at last she found a young woman who gave her a mount behind her on her horse, and in this way she reached her father's house, although it was now late, and her sister counselled her to come home with her for the night. But Agnes thought her duty was to go home, as perhaps her father would be waiting for her. When she saw the house all dark and closed, her heart sank somewhat; but she would not be daunted. Going up she knocked at the door and then called aloud under the window of her father's room, asking him to throw her down the key, which he always took up to bed with him. "Thou shalt never enter my house again. Thou art no daughter of mine. Where thou hast been all day thou mayest go at night." "But, father, father, you did give me leave to go," she pleaded. "Did I give thee leave to ride behind Mr. Bunyan? Go to him, thou disobedient girl; thou art no child of mine." And so saying he banged to the lattice very fiercely, and Agnes was left standing without in the cold and damp. "That is the work of wicked Farry. He has been with father again, poisoning his mind; but I will pray for him, and perchance on the morrow he will hear me, and let me come to him once more." But upon the morrow the old man seemed more implacable than ever. He was rather startled at finding his daughter in the barn in her riding-dress; but he would not hear a word from her. He poured out his fury upon her in such ungoverned language that it was all the poor girl could do to keep from turning and fleeing from him. Yet, mindful of her resolve to bear all meekly, she continued to follow him about and plead to be taken in; till at last the old man in a fit of ungovernable fury ran at her with the pitch-fork that he had in his hand, and Agnes barely escaped receiving a serious injury. "I will go to Prudence's house for a while, father," she said gently after this. "I trust by the morrow you will have forgiven me if I did wrong in riding with Mr. Bunyan. Indeed, he was loth to take me; but I was so anxious to go. Perhaps I was somewhat wrong to urge it so vehemently; but one day you will forgive, and let me be your daughter again." Yet in spite of all the persuasions of the married daughter and son-in-law, and the dutiful gentleness of Agnes, it was not till the third day that the old man's fit of passionate fury spent itself, and he rather sullenly consented that Agnes should come home once more. When first she began her accustomed duties about the house, he was very morose, and would scarcely speak to her; but gradually her gentleness and sweetness seemed to soften him, and upon the day following he appeared to have forgotten his ill-will, and they spent the evening peacefully together in cheerful conversation. But the old man complained of being cold, which, indeed, was scarcely to be wondered at since the wind had changed and brought with it a fall of snow. Agnes gave him his supper somewhat earlier than usual, and he went to bed, she following his example only a little later. Towards midnight she was awakened by the sound of dismal groaning from her father's room, and rushing to him discovered that he was in sore pain, and could scarcely draw his breath. "I have been struck to the heart!" he gasped, "I am about to die. God be merciful to me, a sinner, and forgive me the sins I have committed towards you, my daughter!" Agnes, in great alarm, flew about, kindling the fire, and making something hot for her father to drink, hoping thus to soothe his pain and restore him; but there was a grey, ashen look upon his face which frightened her terribly; and she was all alone with him in the house. The terrible spasm lasted about half an hour, and then the old man fell back in a dying state. Agnes, so soon as she saw herself quite helpless to assist him, rushed forth to her sister's house, and make known her terrible plight. They all followed her back in great dismay; but only to witness the last struggle as the old man passed into eternity. Agnes was crushed to the earth by this blow; but she was not suffered to mourn her dead in peace. The next day her brother-in-law came to her with a very disturbed face, and said that Lawyer Farry desired speech of her, and when Agnes would have refused to see him, she was told that it would not be wise to do so, as the matter on which he had come was of grave moment. When she saw the lawyer's evil, shifty face, and the gleam of triumphant malevolence in his eyes she felt her heart sink for a moment; but then rallying her courage she met his gaze fearlessly, and asked him what his business was with her. "I have come to offer you the only hope of escaping the punishment of your crime. There is one and only one way by which you can save yourself from the awful doom that awaits you." "You are speaking in riddles to me, sir," said Agnes; "I pray you say plainly what you have come to say, and leave me." His eyes looked more malevolent still as he came a step nearer. "Girl," he said, in very low and terrible tones, "do you know that the doom of the parricide is death at the stake?" Agnes recoiled in horror from the word parricide. The colour forsook her cheeks; she trembled as she stood. What awful thought had come into that man's evil mind? "Yes, guilty woman, you may well tremble and quail, now that your guilty purpose is known. But listen yet. I am the only person who can bear testimony against you, and I will save you on one condition: Be my wife, and I will say nothing. The world will never know that Agnes Beaumont is a murderess—a parricide!" "I will never marry you. God knows that I am innocent of the awful sin you lay at my door. I will trust to Him to save me from the malice of my persecutors." "May God forgive you for the cruel deed you are about to do. Into His hands I entrust my cause." Later in the day her sister came to her in deep agitation. "Agnes, Agnes, why wouldest thou not submit to his will? He is such a crafty, cruel man. He will obtain thine undoing! Oh, sister, sister, dost know what he is about to swear before the coroner to-morrow?" "That I poisoned my father—he has said as much," answered Agnes quietly; "but he can prove nothing that he says." "Nay, but it is more than that. He has got such a story. He says that Mr. Bunyan did give thee the poison, and that he saw you twain riding together, and heard you speaking together of our father as he passed. He says that when he got here poor father told him that he was sure you meant him ill, and that you would find a way of getting rid of him, since you only promised obedience to his wishes so long as he lived. Oh, the story he has made of it! And then he points out how loth father was to take you back, and that he turned you away and said you were no daughter of his, and might go back to those you had come from. He learned so many things from us, ere ever we knew the hideous thing in his mind. Now he says his case is complete and that only by marrying him can you escape that awful death. Oh, Agnes, Agnes, wilt thou not do his bidding to save thyself from that fate?" "Take a false vow of love and obedience to a man like that? Oh, sister, how could I? And what would life be with him afterwards?" "But they say it will be death at the stake!" wept Prudence. "And has not the Lord promised 'When thou passest through the fire I will be with thee'?" asked Agnes calmly. "I dare not be false to Him; and I know He will not be false to me. Be not afraid; this trial may be sent for some good purpose. But it cuts me to the heart that he should bring in Mr. Bunyan's name. That is a needless piece of wickedness and falsehood." "It is all false together; but he vows that Mr. Bunyan wished to get possession of father's money by wedding with you, and that therefore he gave you the poison and bid you use it upon the first opportunity." To the two inexperienced women, clinging together in their hour of affliction, it seemed to them as though the doom of Agnes had already well nigh gone forth. They knew how clever and unscrupulous Lawyer Farry was, and how successful he generally proved in carrying through the schemes to which he gave his mind. Already the neighbourhood was ringing with the story that Agnes had poisoned her father, and although many refused to believe in so monstrous a charge, yet it was very well known how violent the old man's rage had been against his daughter, and that he had died also immediately after Agnes had been taken back to his house. This was not evidence, but it raised doubts and suspicions in many minds. The coroner and the jury had assembled, having first viewed the corpse, and Mr. Hatfield, the surgeon, testified emphatically that he regarded death as due to natural causes. The old man had long been suffering from some cardiac derangement, and the excitement into which he had recently thrown himself would be quite enough to account for the fatal seizure. Agnes Beaumont, he added, had given him free leave to make a post-mortem examination, but in his opinion the thing was not necessary. Farry was then bidden to state what he knew and what grounds he had for asserting that his friend had been poisoned. At first he was very bold and confident in his manner, but he soon found that it was a very different matter intimidating young and ignorant women and dealing with a shrewd man of business. Under cross-examination his tale became confused, contradictory, absurd; his malice flashed out so unmistakably as to put all the jury on their guard, and when Agnes's sister stepped forward and asked to be permitted to say that Mr. Farry had promised to be silent if Agnes would consent to be his wife, a deep murmur of indignation ran through the room, and the man knew himself defeated and disgraced. When Agnes was called, and came forward with her simple and unvarnished tale, it only needed a look into her calm, sweet face to know that she spoke the truth. She freely told of the difference she had had with her father, and how Mr. Bunyan had warned her not to urge her own desire too much, but to be dutiful and obedient. 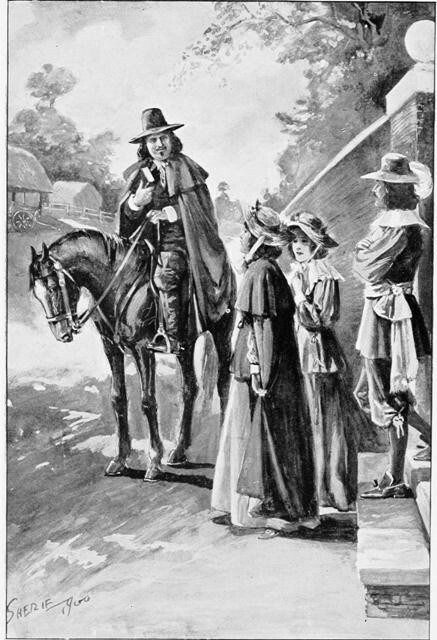 And her sister corroborating this statement, and adding all she had seen of Agnes's gentle submissiveness on her return, and another person giving testimony that John Bunyan had a wife living, and that the idea of his wanting Agnes's hand was nonsense, the whole of Farry's ingenious and malicious tale fell to the ground, and he stood like one who would never lift up his head again. "But if there be any doubt," said Agnes, looking at the coroner, "Mr. Hatfield is here; he will make the needful examination." "That is a question for the jury to decide," answered the coroner, with a smile. "Let them retire, and give us their verdict." A few minutes was all these honest men required before announcing that death was due to natural causes; and then the coroner turned upon Farry and with a most scathing reproof dismissed him, warning him that he had brought himself perilously near a charge of perjury, had Agnes been a vindictive foe. "You have been a courageous girl, my dear, in withstanding the artifices of that wicked man. Hardly another maid so young and unprotected but would have been intimidated into accepting his condition. What made you so brave to withstand him?" "I do not think I was brave," answered Agnes; "but I knew I should be helped." The old man smiled and patted her head. "Perhaps that is the best kind of courage after all."